This past weekend, I headed to Toronto for a day with my daughter, then a day to gather with Christian women from across Canada on the Saturday. I had some glimpses into how God was going to meet me there throughout my Friday. There were a few things on my want list which I had been hunting for over the past few months. Not only did I get all of those, I got a few extra blessings added to the mix. my three favorite flavours of candy (marshmellow, dark chocolate and marzipan) in egg shaped deliciousness. God speaks to me a great deal through birds, so this was a double extra dollop of blessing! I saw three distinct groups of three pigeons on the way to the conference. As this is unusual in the birdie kingdom, I choose to believe God was trying to reassure me He was going to meet us there. The conference began with worship, a few intros, then delivered a Holy Spirit power punch with its first panel. Each of seven women shared who they are, and which women they represented. I could hardly breathe, I was so moved by what they shared. Then, in an unexpected twist, we had to turn to someone we didn’t know and do the same. My daughter and I got to connect with a lovely woman who is from the very country my daughter ministered in and longs to return to. As the day continued, layer upon layer of love, grace, and community were imparted deep within. I quickly became undone, broken yet healed at the same time as the day went on. Tears, laughter, silence, exuberance and passion all rose and fell as I allowed God to minister to me through my sisters. We are not that unalike. We are never so far gone Grace can’t meet us there. I am daughter, wife, mother, friend, coworker, neighbor. I am the gal who used to always say yes for fear of rejection if I chose no. I am the heart which has been abandoned, rejected, betrayed. I am the girl who was broken, bullied and unseen. I am the one who has felt the searing pain of loss and wept the bitter tears of grief. I am the soul who has dropped to the ground from the guilty weight of my sin, and hidden for shame from the sins of others forced upon me. I am the woman who has been unheard and overlooked, who felt lonely in the midst of the crowd. I am the woman who tried to squelch my emotions by ignoring them as I pursued avenues of distraction. I am the prodigal who ran far and long before I made my limping return home bowed low. I represent the woman who is in all of us. The one who only feels her lack. I also represent the woman who is possible in all of us. I am the woman who Love lifted from the pit of despair and enveloped in loving arms. I am the woman who is accepted as she is. I am the woman bought at the greatest price possible. I am the woman whose chains have been blown apart as Love moved to set me free. I am the woman who discovered she is a delight. Even in her bed head rumpled first thing in the morning pyjamas. Even when the tears leave my eyes swollen and my face blotchy. Even when I cry out to God screaming “Why?” Even when its been too long since we last met. I am the woman who used to bottle it all in until I discovered the God whose hobby is to bottle my tears because I am so precious to Him. The same Grace that met me face to face in the lowest of my brokenness meets me again each and every day. In the celebrations of life, in the woes of death. When I have plenty, when I am empty. When I feel lonely on the outskirts, or surrounded by the crowd. I have found His Grace more than enough for each day I have sought Him, and welcomed Him into all I am. When Jesus died for you, He did so for you at your very worst, so He could release you into the very best that He has for you. Life with Him. Grace upon grace upon grace. The grace He extends us each day becomes part of the bigger story of Grace He is writing into the stories of each of His Beloved. Putting the past in its place historically, His story writes a new glimpse of who He is in your life daily. 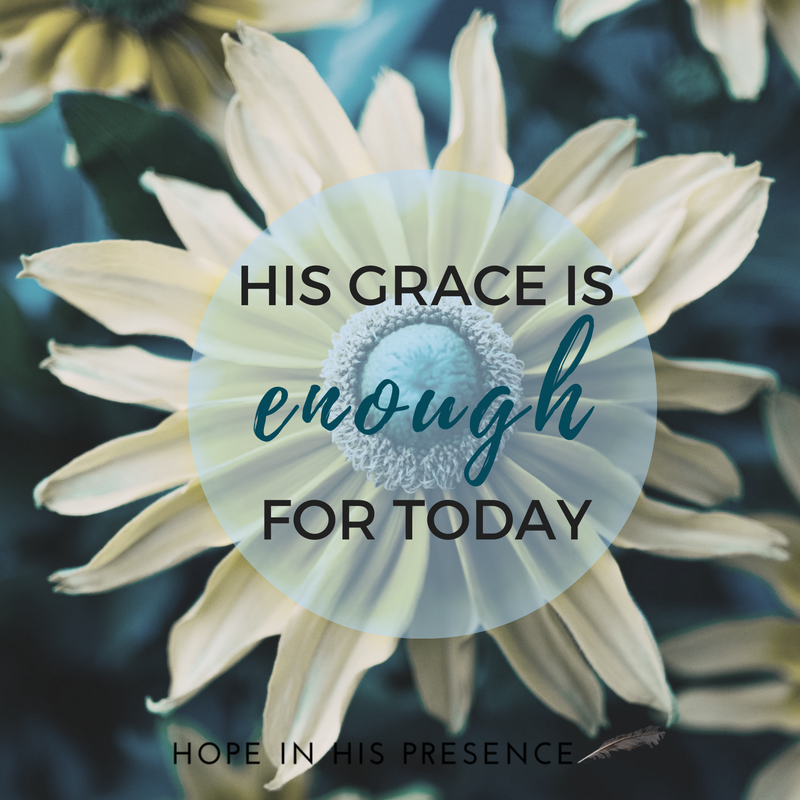 His Grace extends in the present to reach everywhere you are, every pain or hurt or place of brokenness you are experiencing, all day and night long. And He never slumbers, so Grace peeks patiently waiting for you to get up on the morrow to meet you there all over again! Even if you don’t feel it, Grace awaits you, always and no matter what. Especially in all the areas where you feel less than. Its time to let who we were fall to the wayside, and run full tilt into the open arms of Grace, Beloved. 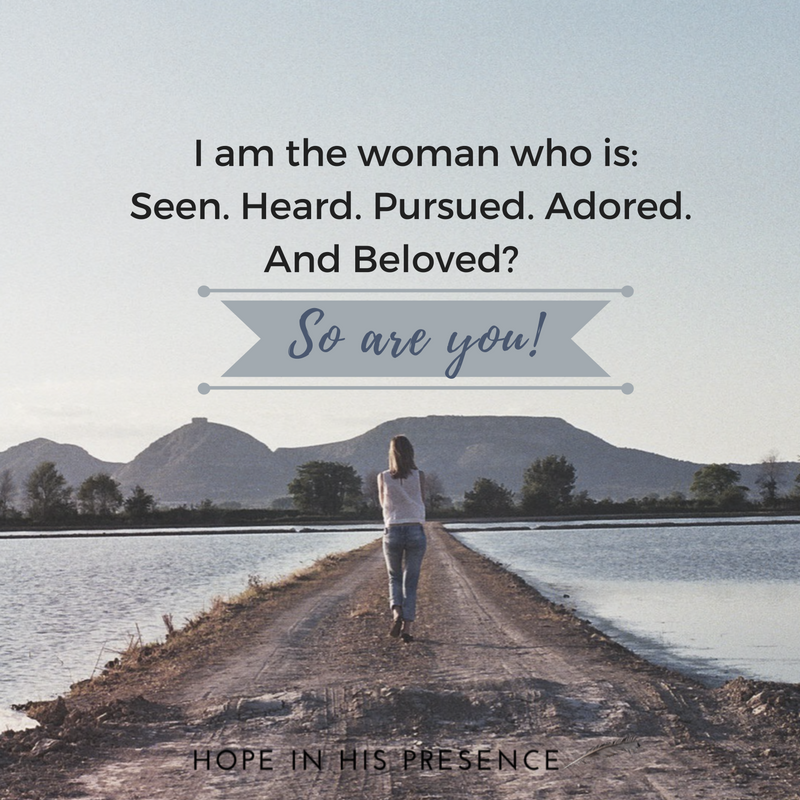 Not only will you find your place in His embrace, you will journey forward into all the ‘I am”-ness that He has awaiting for you in His presence every day you choose to meet Him and seek the way of Grace. For His Grace? More than enough, always. Oh, Karla, I LOVE THIS! i will share it from the rooftops! You have captured what every woman needs to hear – that she is loved, right where she is at, by the most wonderful, mighty God on High. And yes, He has the power to lift us up, to reclaim and restore us! Thank you for such an eloquent, powerful post. Blessings! Thank you from this still shaking heart, Linda. I needed to hear that one had been touched. 😉 Many blessings on you as you press into Grace!